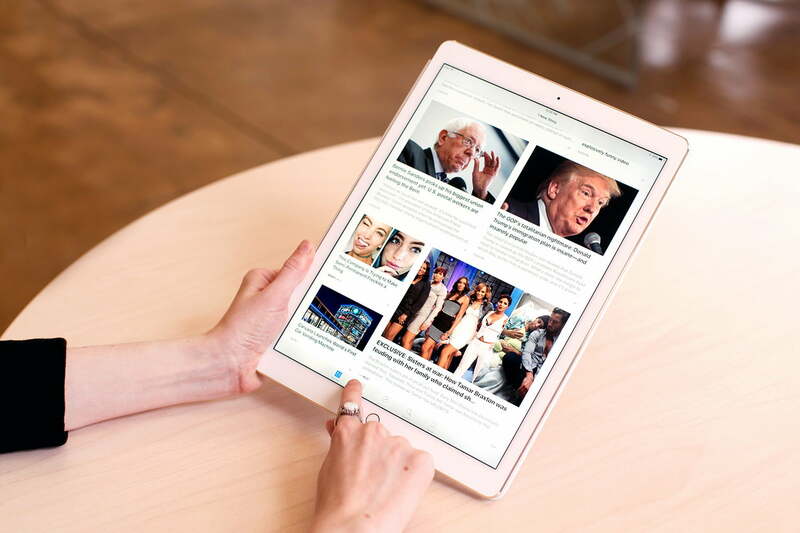 Update: Apple has finally updated the iPad lineup with a new fifth-generation, 9.7-inch device — and we think the new iPad is the best all-around tablet, especially with its killer $330 price tag. A lot of people didn’t understand the first iPad way back when. You’d hear things like “what a dumb idea — It’s too big!” or jokes about it just being a big iPhone. 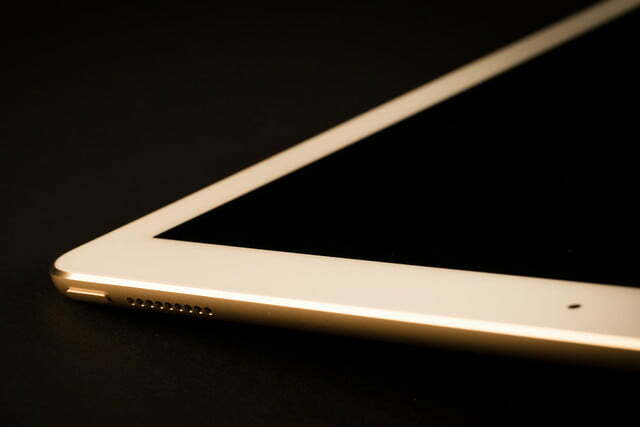 Then the iPad went on to kick off an entirely new era in tablets, phones, laptops, and other gadgets. It’s gotten thinner, sexier, and smarter each year, but not even Apple’s magic has managed to save the iPad from slumping sales. 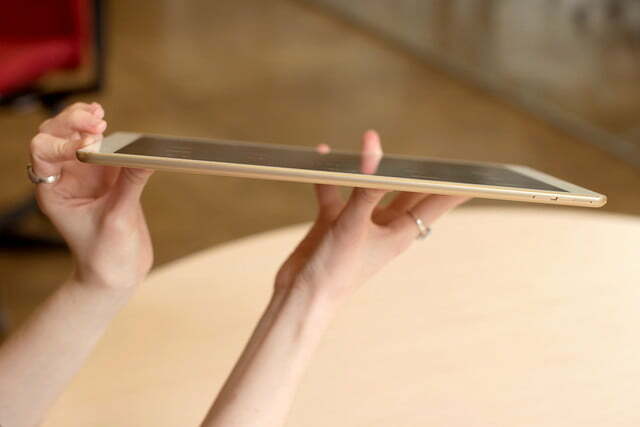 As our phones have gotten bigger, our need for smaller tablets has all but disappeared. Our real computer is in our pockets, and we don’t need to carry around a slightly bigger version of the iPhone any more. We need something different that changes the game again. 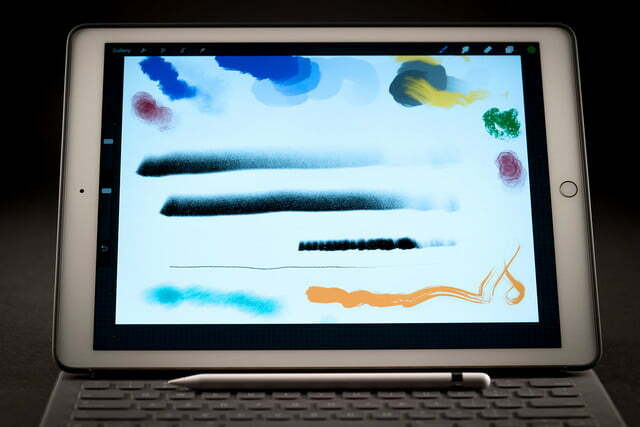 Enter the Surface Pro iPad Pro. 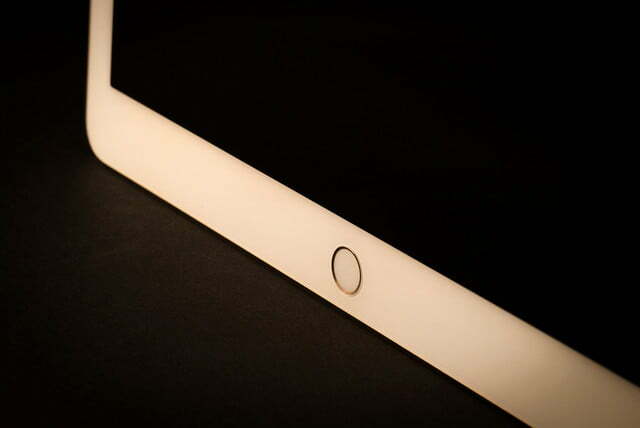 There’s nothing mysterious about the iPad Pro. 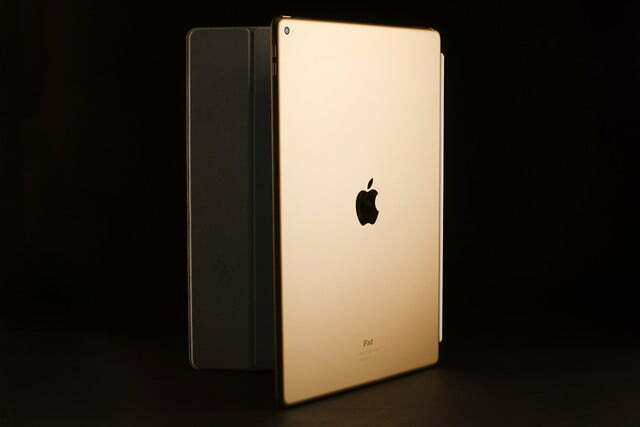 It looks exactly like the iPad Air and iPad Mini have for a couple years now. The only difference is that it’s ginormous. 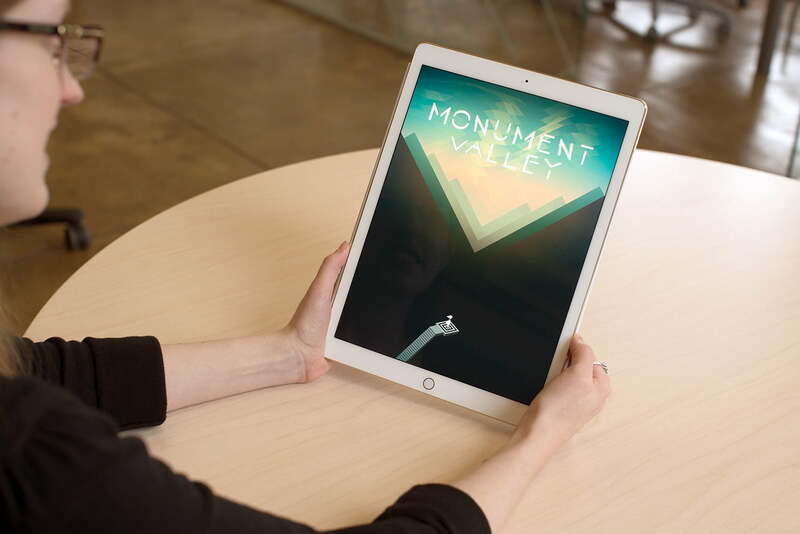 With a 12.9-inch screen, the first time you hold it, you’re in awe. It’s almost like you angrily ripped off the screen of a laptop and decided it’s totally normal to carry it around. That feeling of absurdity fades away as soon as you start to use it. Here’s a good way to visualize its size: If you have a regular 9.7-inch iPad Air, set it down and picture another iPad Air sitting next to it. Combine them and you have an iPad Pro. 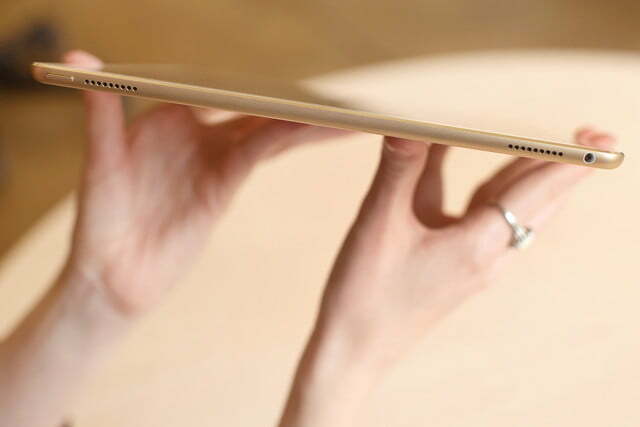 It’s about as thin as other iPads, and for its size, is downright lean at 1.6 pounds. Just a few years ago, nearly every small tablet weighed that much, and spread across this size, it doesn’t feel heavier than it should. With two hands, it’s comfortable to hold, even while reading for a few hours. It’s impossible to hold one-handed for long, so you’re not going to be able to hold the subway pole in one hand and the iPad Pro in the other during your commute (if you’re a New Yorker). It’s not ideal to carry around with you if you’re used to a 7- or 8-inch tablet, but it’s a fair sight lighter than a laptop, and I’d argue that most people don’t actually bring their iPad Air around with them everyday either. 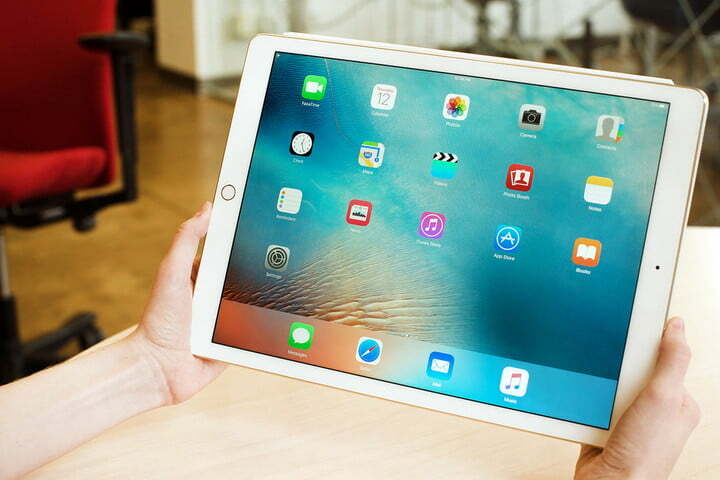 The iPad usually lives at home — so why not make it larger? It could be a laptop replacement for millennials who really don’t need or want a PC. It could be a laptop replacement for millennials who really don’t need or want a PC. Many people will argue that 13 inches is insane, simply too big for a tablet. We cannot disagree. 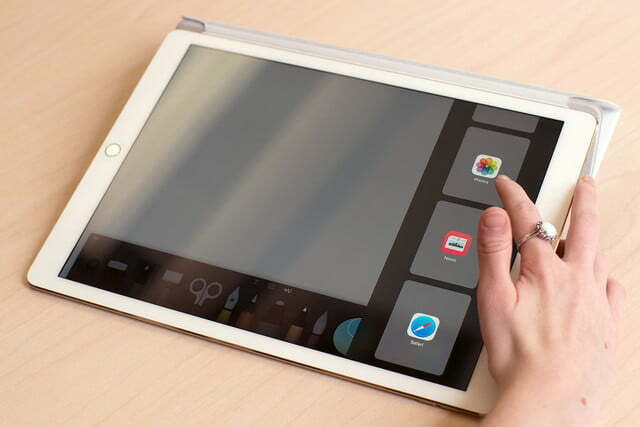 For a lot of people, this iPad would be a preposterous purchase. With the accessories and a decent amount of memory, it’s going to cost you $1,000 or more. It’s more of a Surface Pro or laptop alternative than a tablet as we know them today. 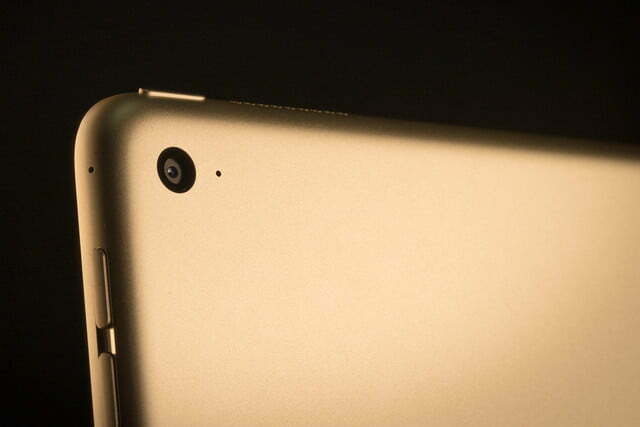 There have been a bunch of large, 13-inch tablets, and most have failed. The difference here is that Apple does have some unique ideas that are more useful with the larger screen. And if you like eye candy, the screen really pops with 2,732 × 2,048 pixels — that’s more than any other iOS device to date. And, because of its loyal fan base, Apple seems to regularly succeed at making successful products that other companies couldn’t seem to sell. It’s a joy to read on the iPad Pro’s larger screen, whether you’re consuming comic books on Scribd, articles in the News app, or content on Safari. It’s more or less the size of a glossy magazine, and I felt like I’d picked up the latest issue of Vogue or The New Yorker when I grabbed the iPad Pro. 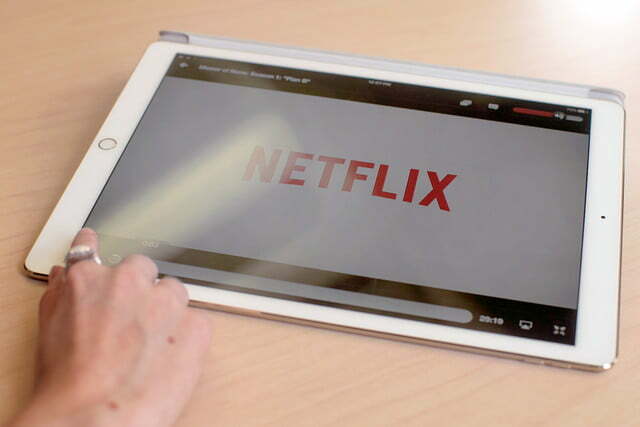 I’ve always liked the iPad Mini for reading because of its compact size and light weight, but there are advantages to the big screen when it comes to consuming certain kinds of content. Reading magazines, comics, or visual news stories on the big screen is preferable, because you can really enjoy the graphics. 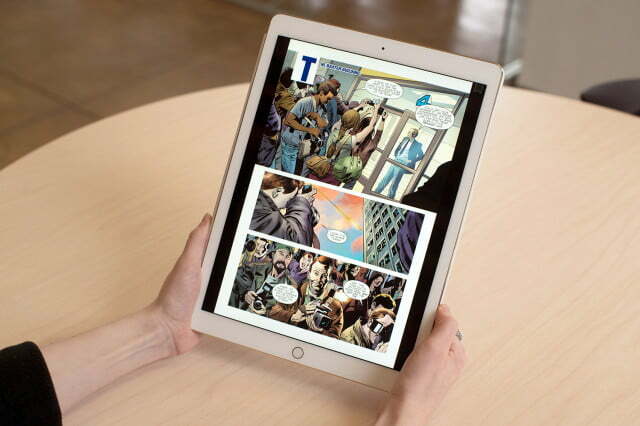 Comics show a two-page view when you turn the Pro to landscape mode, which makes it feel even more natural. However, ebooks or text-heavy articles are still best on smaller devices. 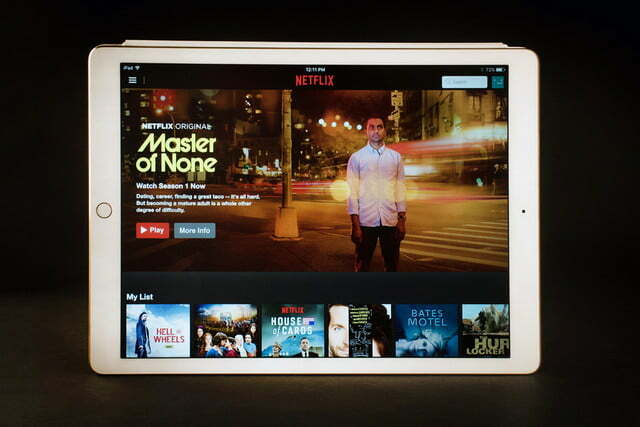 When it comes to watching movies and TV shows, the iPad Pro really shines. The pixel-dense screen is large enough to satisfy your craving for Netflix in bed, but not so big as to crush your chest halfway through a Game of Thrones marathon. 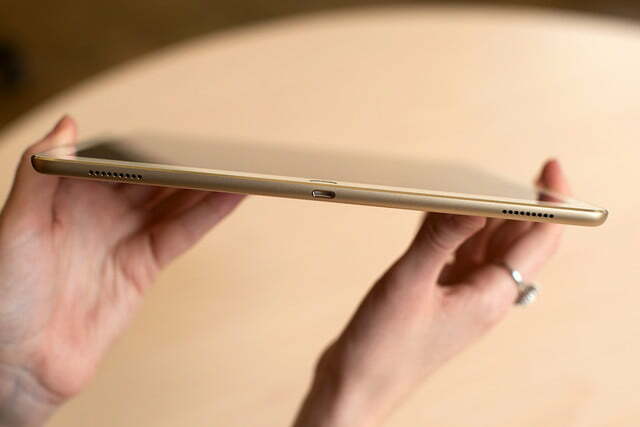 Samsung’s Galaxy View tablet — although intriguing in its own way — is far too massive and heavy to bring into bed with you; it has to live on your bedside table. The iPad Pro is more comfortable, and compared to the View it’s downright tiny! We found it the ideal size to bring on a road trip or plane ride. This one will fit in your carry-on and rest on your tray table without attracting too much attention. 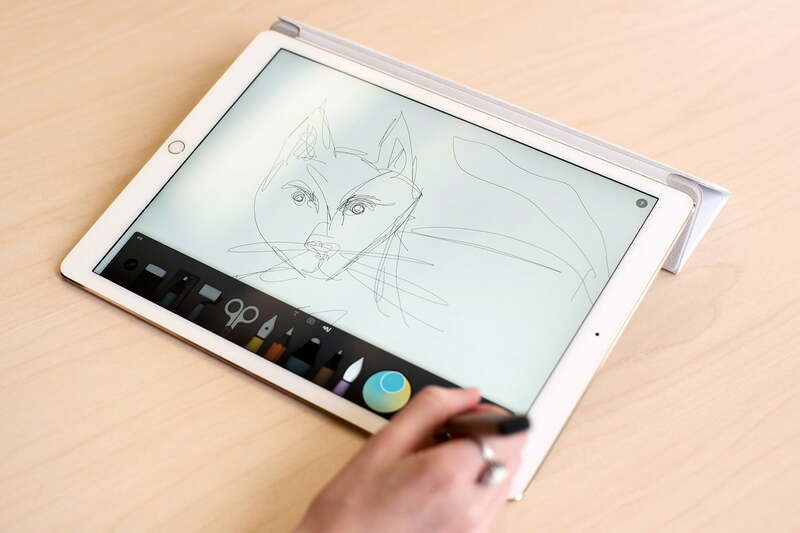 The larger screen is also a boon to artists who have long loved the iPad for its excellent drawing apps and crisp screen. 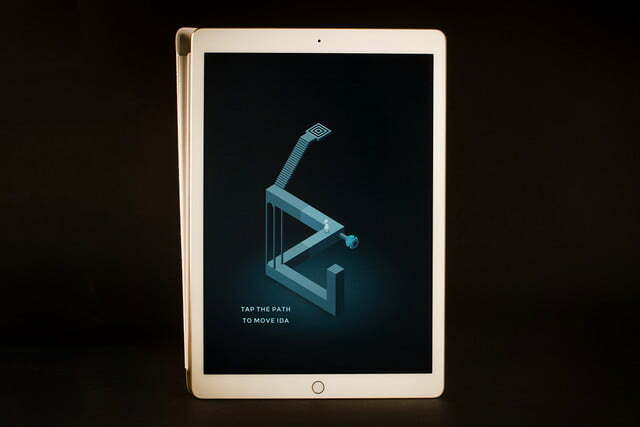 While a 9.7-inch screen may be big enough for most people, it’s not enough room for artists. 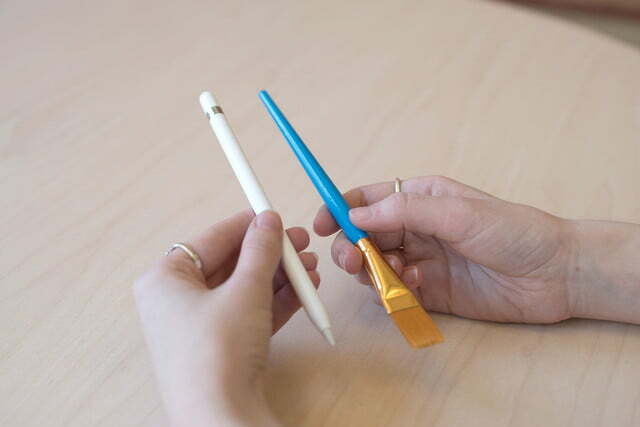 The bigger the canvas, the happier the painter. 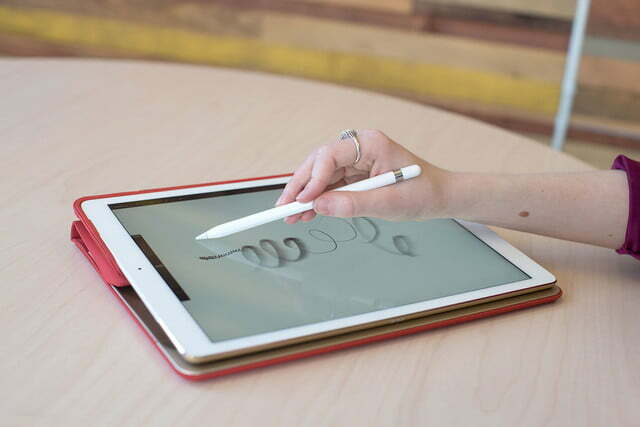 When paired with Pencil, the iPad Pro is a real game changer for digital artists. Before the Apple Pencil came in the mail, I did some early testing with my favorite Bluetooth styli from Adonit and FiftyThree. 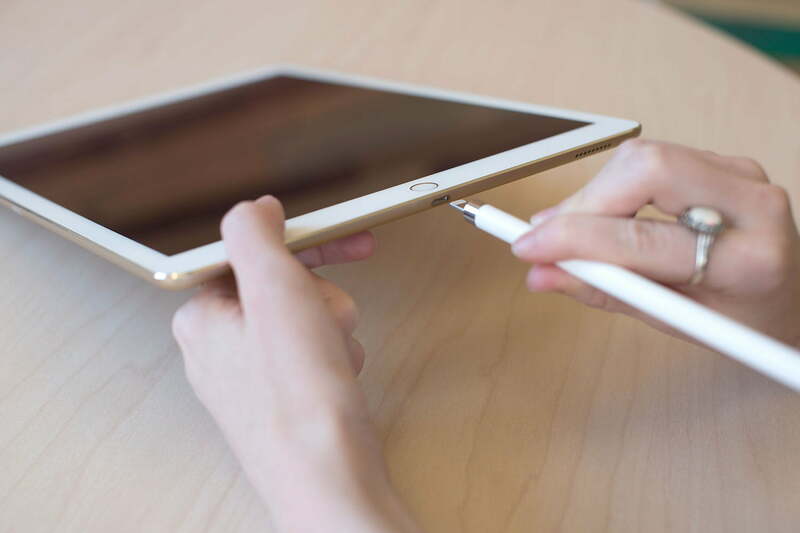 Although the other styli worked well, and I could feel the benefit of the larger screen, all the cool pressure sensing tech Apple put underneath the surface wasn’t accessible until I pulled out the Apple Pencil. The Apple Pencil makes the stylus useful. 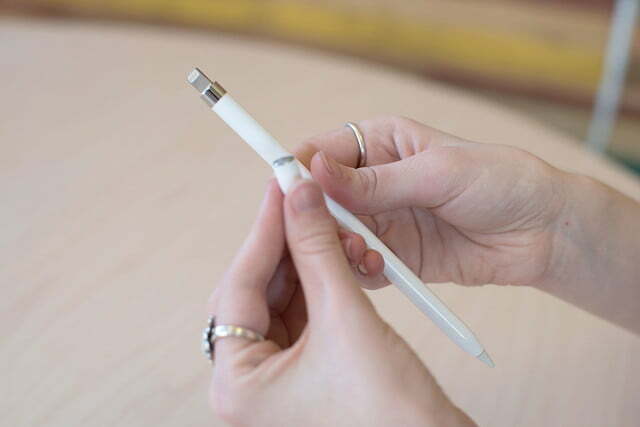 It is the fastest, most responsive, and utterly perfect stylus I have ever used. There is no lag at all and I felt like I was actually drawing with a real pencil on a sheet of paper. 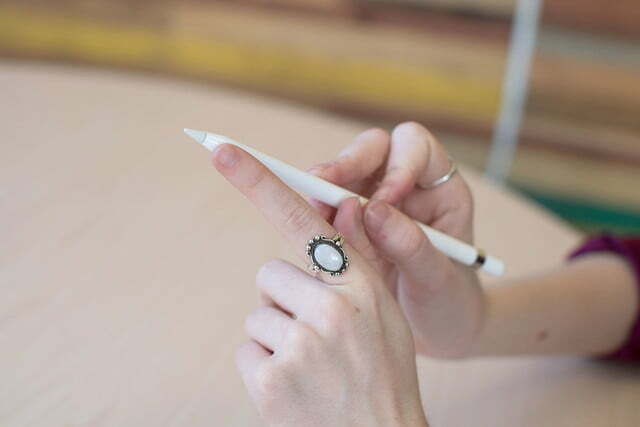 The soft tip doesn’t clack like Adonit’s stylus does, and it can produce incredibly fine lines with variations in gradient as you increase pressure. 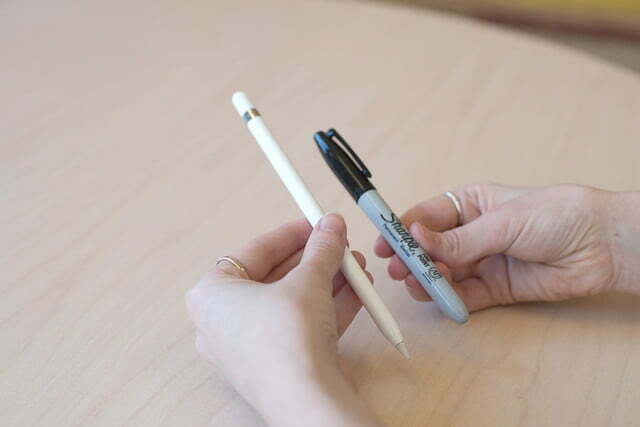 Like FiftyThree’s Pencil, the side of the tip creates wider strokes, and it’s absolutely perfect for shading when you’re mimicking the effect of charcoal, graphite, or soft pastels. Apple Pencil is the best of both worlds: It provides a fine point when you need it and a wide one when you want it. Although it looks long in pictures, it doesn’t feel odd in your hand. It’s the perfect width and weight, though it is slippery. Sometimes it’s nice to have grip when you’re doing detail work in an art piece. The only downsides to Pencil are that it doesn’t have an eraser on the end, and that little charging cap is so easy to lose. I treat that little cap, which covers the lightning charger like it’s my first-born child. 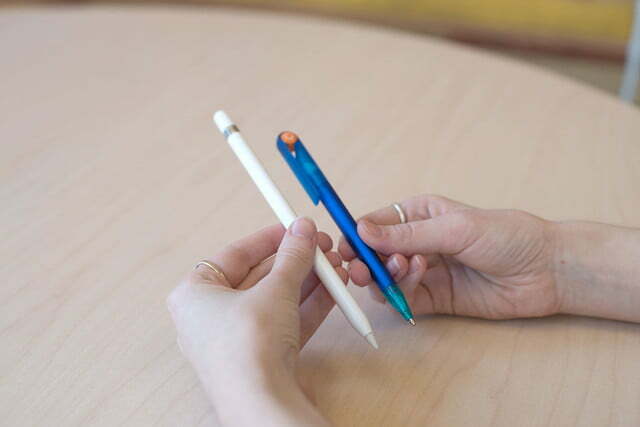 Although the cap is all too easy to lose, the way the pencil charges is fun and easy. You just pop it in the iPad Pro’s lightning port (or the adapter for the wall outlet) and it charges right up. 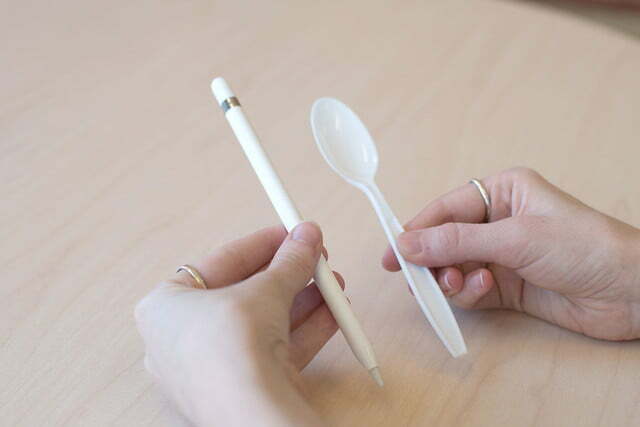 That’s also how you pair the Pencil to the tablet. 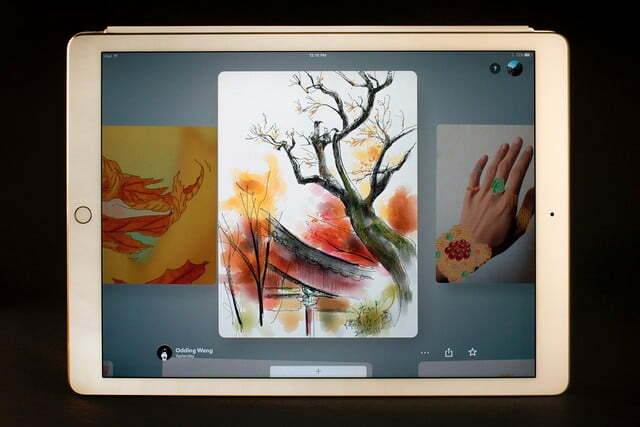 Procreate, Adobe’s app suite, and FiftyThree’s Paper look splendid on the big screen. 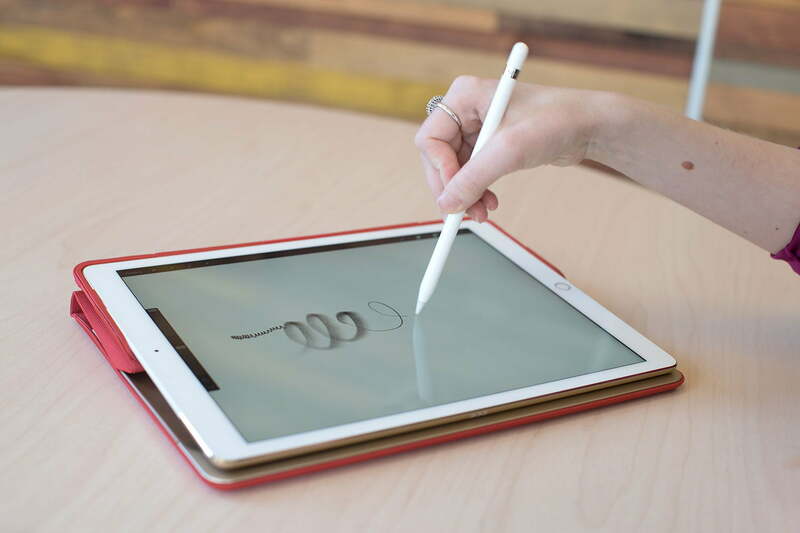 There are a number of great drawing apps that are optimized for Pencil and the iPad Pro as well; here are some of my personal favorites. Of the bunch, Procreate feels the most attuned to the Pencil and the iPad Pro’s pressure sensors. It shows the greatest variations in gradient as you apply different amounts of pressure. Drawing on the iPad Pro is a dream, and the tablet’s ability to run several Adobe apps without a hitch is fantastic. 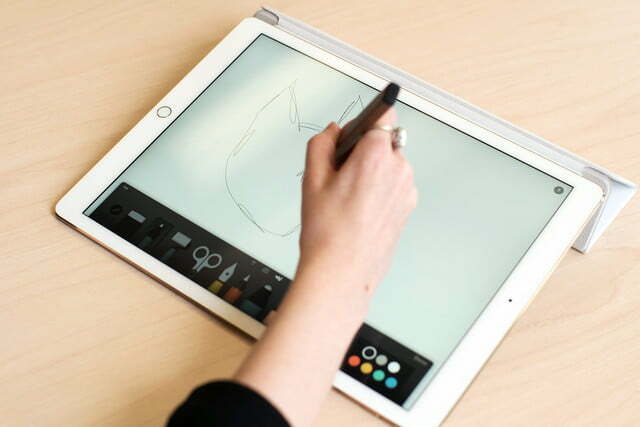 The AstroPad app ensures that comic book artists, illustrators, and other creatives who once had to buy Wacom tablets no longer need to — the iPad Pro and Pencil are the answer. It’s hard to explain how incredible it feels to draw on the iPad Pro. 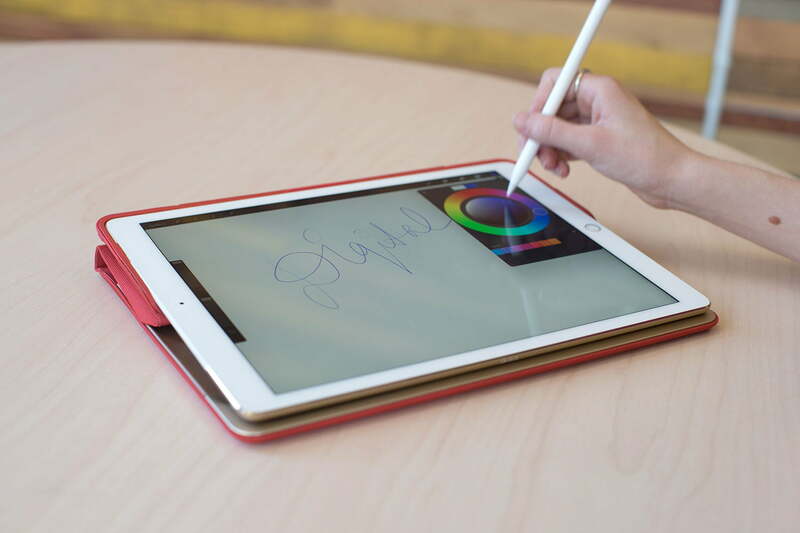 On the iPad Mini and even on the Air, space feels tight when you’re drawing — not so with the Pro. Since the screen area is larger than your standard sketchbook, you have room to let your ideas flow. 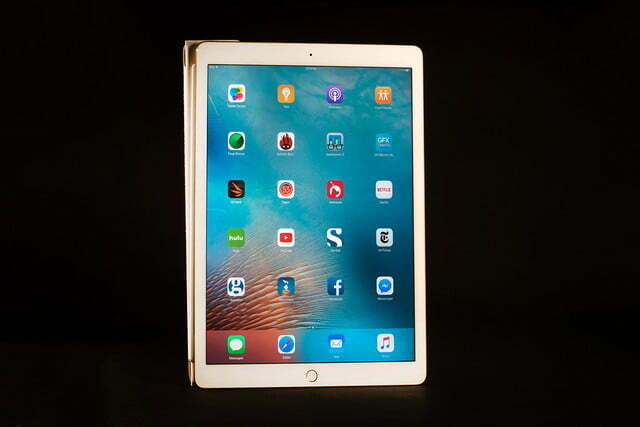 Our Computing writer Brad Bourque used the iPad Pro as his laptop for an extended amount of time to put the tablet through its paces. You can read about his experience here. As Brad points out, in order to replace a laptop, the iPad Pro has to be versatile enough to take on all the tasks of the day, and well equipped enough to deal with any problems that arise without getting in the way. Performance and responsiveness are one part of the equation, but so is the ability to organize emails quickly to look for a message, or to relax after a long day of work. He found the iPad Pro to be versatile and effective at most tasks, but there were a few big pitfalls to using it as his main laptop. Some of the apps — like Trello, an essential part of DT’s workflow — don’t work as well on iOS as they do on a desktop, and switching between numerous apps can be a real headache. 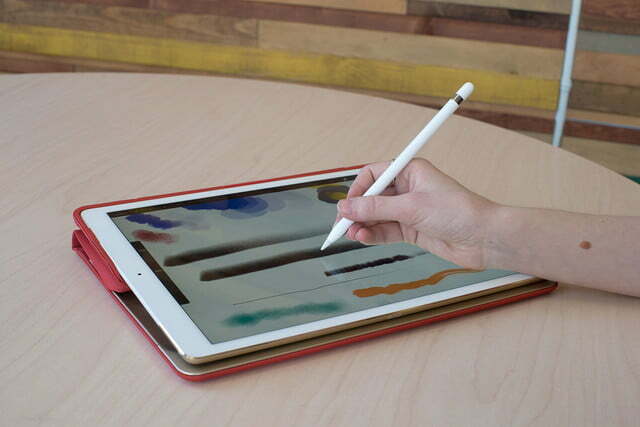 The iPad Pro works best if you’re willing — and able — to alter your workflow to its favor. It’s not going to change how it operates to fit what you do, and despite the new split-screen option; that often means focusing on one task at a time. While sliding into Slack or Spotify continues to feel smooth, attempting to run two apps side-by-side in Split View doesn’t feel comfortable: There’s not enough room to edit a spreadsheet while simultaneously editing a document. The split-screen mode was helpful, but Brad found the slide-over function, which momentarily overlays one app on another, much more useful. Slack fit into this workflow perfectly. It was always a quick swipe away, so it was easy to respond to messages and participate in group chats quickly. There are other oddities, too. Those who use Chrome will run into problems with Safari, the default browser on iOS. Unfortunately, links in other apps open there instead of Chrome, which resulted in a lot of time spent copying and pasting links into Chrome tabs. Ultimately, the real issue isn’t app compatibility, or the way each is supported. The issue is when something goes wrong, you’re out of luck. If a service like Trello hits a snag on the PC, you can restart the browser, or try a different browser. If the Trello app doesn’t work on the iPad, there’s not much you can do. Such moments will force you to reach for your PC, Brad points out. 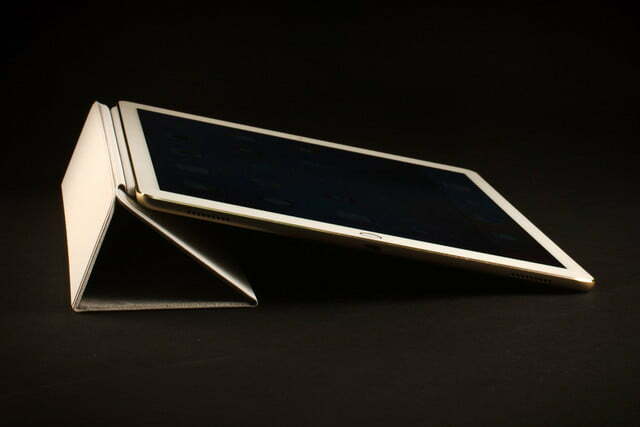 So, can an iPad Pro replace your laptop? It depends how you like to work. If your day-to-day involves many browser tabs and application windows at once, this might overwhelm the singular focus of iOS. Conversely, those who sit and stare at one document, or spend hours editing a single image, will find a lot to love in the iPad Pro. 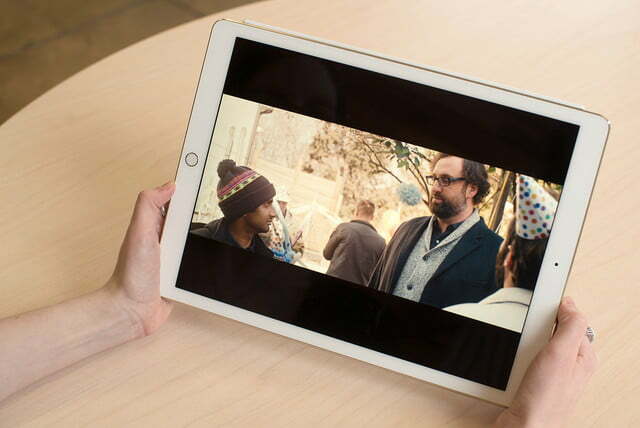 Either way, you’ll have to make concessions in your workflow to take full advantage of what the iPad is offering. There isn’t much room to tinker around under the hood, with a distinct lack of file explorer or sideloading privileges. Apps either run smoothly and function well, or they don’t work at all. The portability, battery life, and big, beautiful screen will appeal to a lot of users, and the trade-off of a locked down OS won’t be noticeable to most of them. The price is the biggest issue. An iPad Pro starts at $800, but you’ll need to spend more for a keyboard accessory (I mostly used Logitech’s, but had time with the Smart Keyboard), putting the total north of $150. That’s in Surface Pro 4 territory, or will purchase a Dell XPS 13. Either machine will be a better choice for productivity. 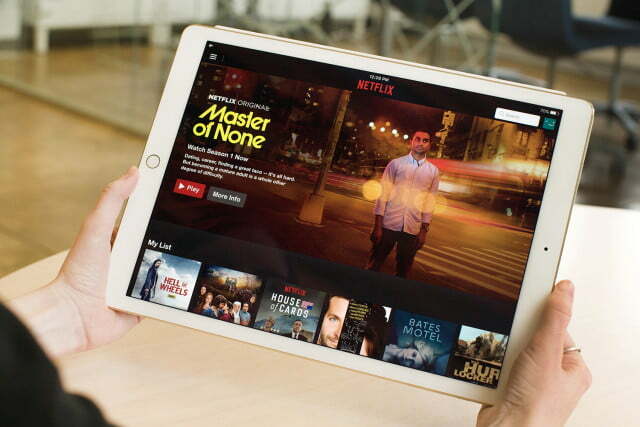 Brad’s time with the iPad Pro proved it’s capable of replacing a laptop. Why anyone would choose to buy it for that purpose isn’t obvious. If you are considering using it as your only machine, we suggest you think carefully about how you use your system. 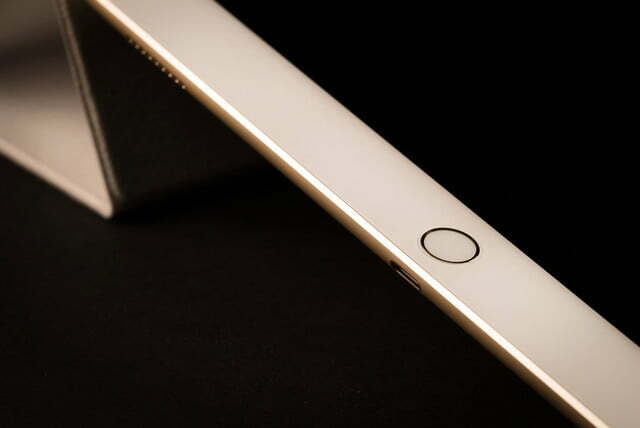 The iPad Pro is sleek, beautiful, and fast, but its limitations might surprise you. Pretend you had to do your entire job using a big version of your smartphone. If there isn’t a good app for something, or you have to multitask a lot, things will get difficult on iPad Pro. 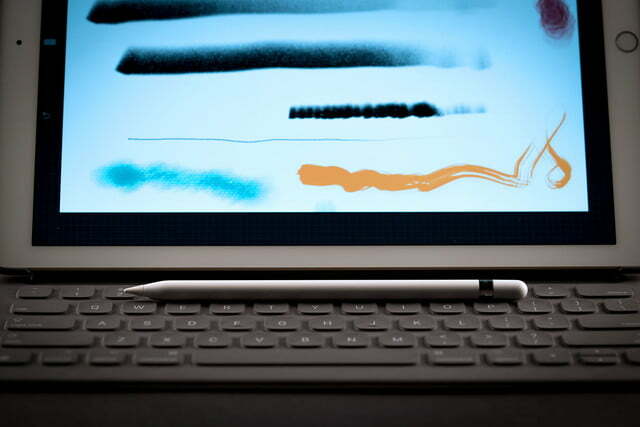 If you’re curious about numbers and specs, here’s the rundown of what the iPad Pro offers. 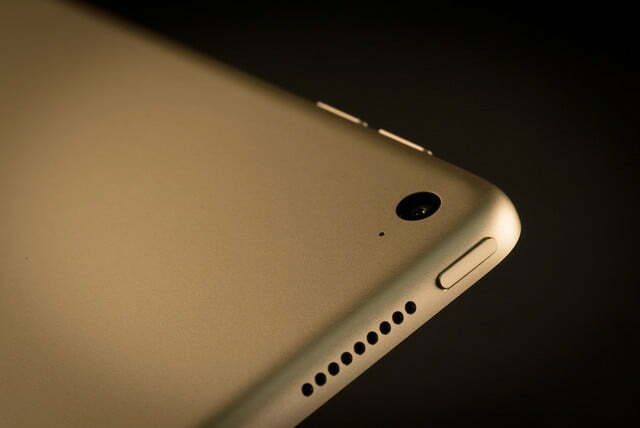 On Geekbench 3, the iPad Pro racked up 3,243 for its single-core score and 5,500 for its multi-core score. The Surface Pro 4 performed slightly worse than the Pro with a single-core score of 3,023, but slightly better with a multi-core score of 6,304. To put both in perspective, the very powerful MacBook Pro 13 with Retina got 3,007 on the single-core score and 6,596 on the multi-core score. In other words, the iPad Pro’s A9X processor and 4GB of RAM are doing a bang-up job imitating laptop-level performance. The tablet also pulled off an impressive 63,542 on AnTuTu’s benchmark and 33,122 on 3D Mark’s Ice Storm Unlimited test, which puts it in laptop territory for both. Benchmarks aren’t everything, but they are a strong indication of just how much power the iPad Pro packs. Apple promises 10 hours of battery life from the iPad Pro, and based on what we’ve seen so far, that seems like a very reasonable estimate. After reading news, drawing, running benchmarks, watching a handful of TV shows, and watching a Disney movie, the Pro still had juice to spare. Of course, given how large it is, it should pack a honking-big battery. In our laptop test, the battery did typically make it through a full day without any problems, which is hugely impressive. 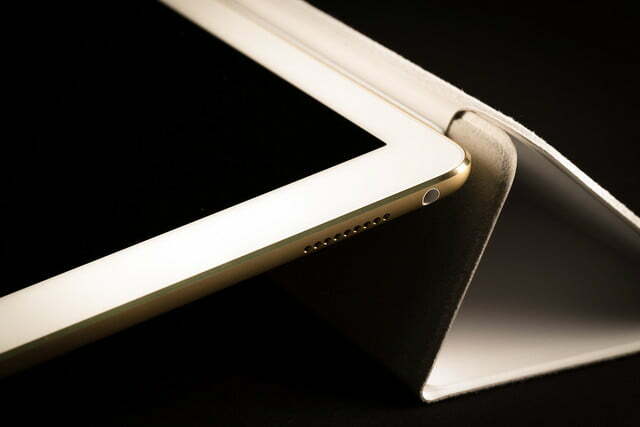 Every iPad comes with a limited warranty that covers one year of hardware repair and up to 90 days of support. You can also always bring your iPad Pro into the Apple Store Genius Bar if you run into problems, AppleCare+ ($100) for iPad extends your coverage to two years after you buy it and adds coverage for two incidents of accidental damage. 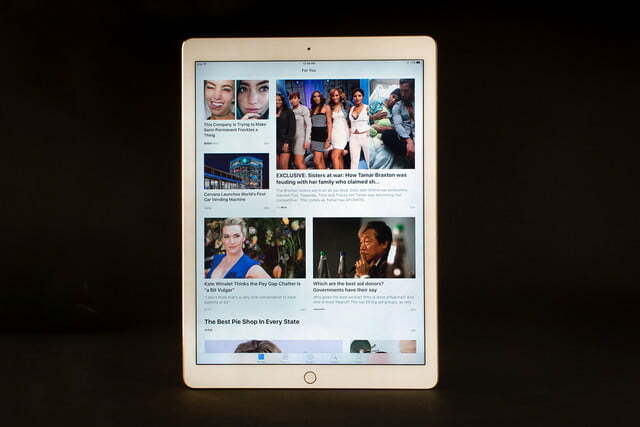 Apple now has an iPad for everyone: The iPad Air 2 is the one for most people; the iPad Mini 4 is for the readers out there who don’t want a Kindle; and the Pro is for anyone who likes the Air but just needs more space to roam. It’s for the person who wants to sketch and manipulate images on a touchscreen, the person who loves watching Netflix in bed, or the person who wants to take work with them on the go without carting around a heavy laptop. 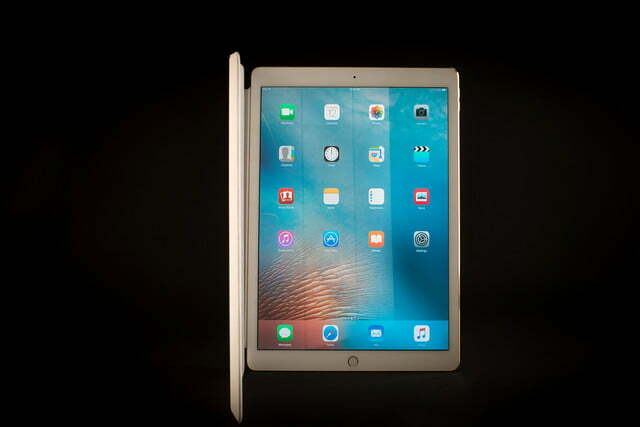 Tablets are still in trouble, but the iPad Pro offer some hope. 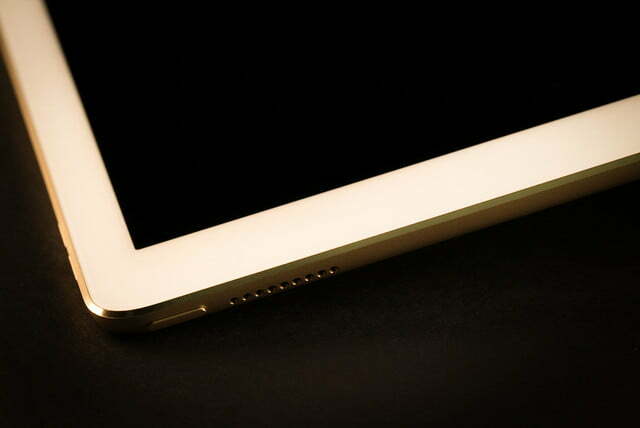 Our phones are already the size of small tablets, so it’s time for the tablet to grow and change. The Pro is closer to a laptop in terms of power, size, and its potential for productivity, but there are still two degrees of separation between the two: iOS and the lack of a keyboard in the box. With multitasking in iOS 9, the iPad moves closer to being truly productive, but it’s not there yet. The fact that you’ll have to shell out $170 for the keyboard cover to make it more like a laptop also stops it from being a true computing device. Of course, there will be third-party keyboards, so don’t fret – that price tag will get lower. For now, though, it’s high. 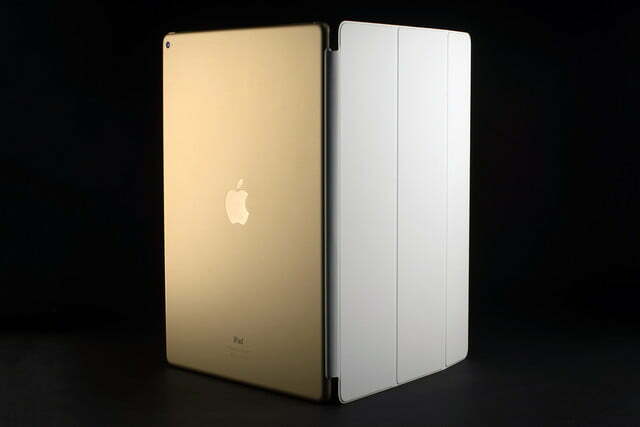 If you’re going to buy an iPad Pro, you’re willing to shell out a lot of money. With that in mind, we recommend shelling out a bit more. Choose the $950 128GB version if you download a lot of apps, movies, and games. It’s only $150 more than the base 32GB model, which costs $800, and you’ll run out of that little storage in no time at all. 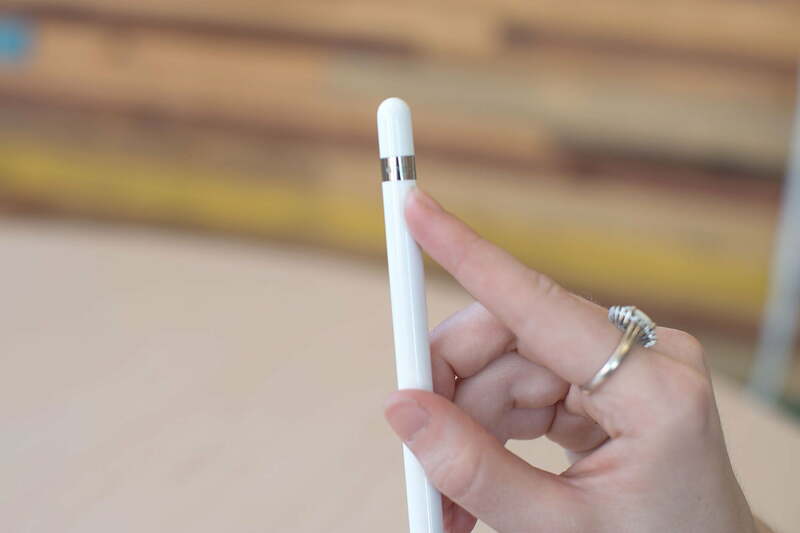 The Pencil will appeal to artists and designers the most, and it’s $100, so it’s on the pricier end of the spectrum for a stylus. But it is absolutely worth every penny for anyone who likes to draw. 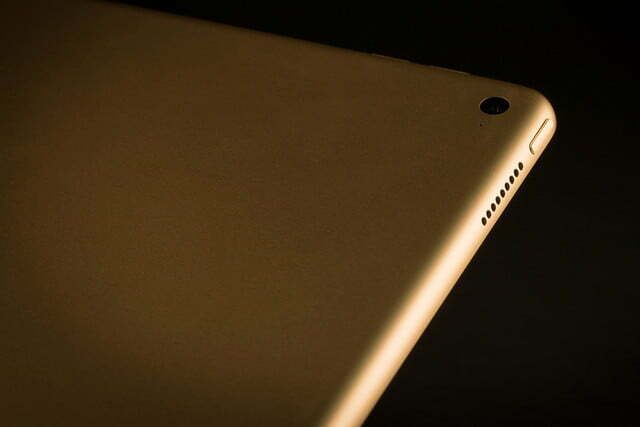 Although the iPad Pro could replace some people’s laptop, it won’t replace everyone’s laptop. If you’re mainly looking for a new laptop, we suggest the Dell XPS 13 or the Surface Pro 4 ahead of the iPad Pro. That said, if you’re a light laptop user who more or less just wants a killer tablet, the Pro could work for you, but it isn’t as cheap as some Windows and Mac options. 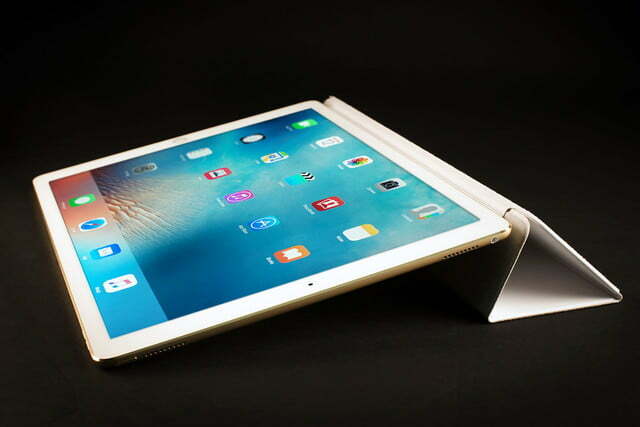 As a tablet, we can confidently recommend the iPad Pro as the best big slate on the market. 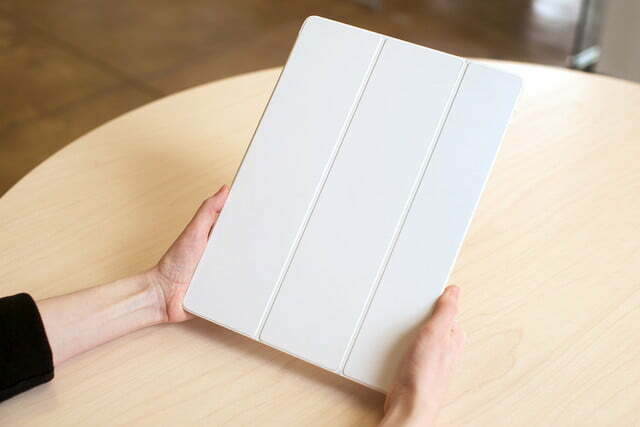 It blows away Samsung’s aging Galaxy Note 12.2 tablet and any of the larger devices in Lenovo’s Yoga tablet line. 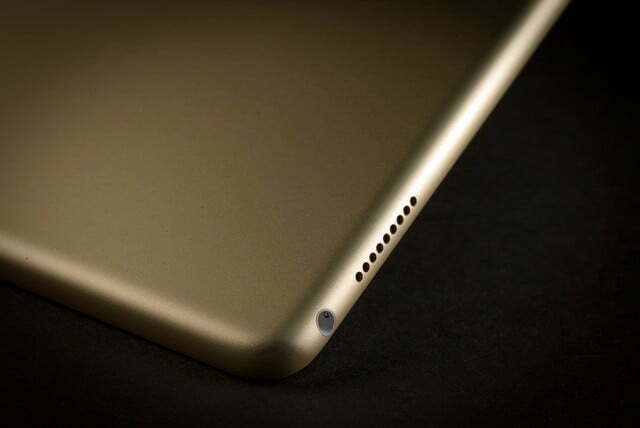 In comparison with the iPad Air 2, it may be bigger, but unless you actually take your iPad Air with you everywhere, the Pro is the better choice. You’ll want the extra screen real estate. 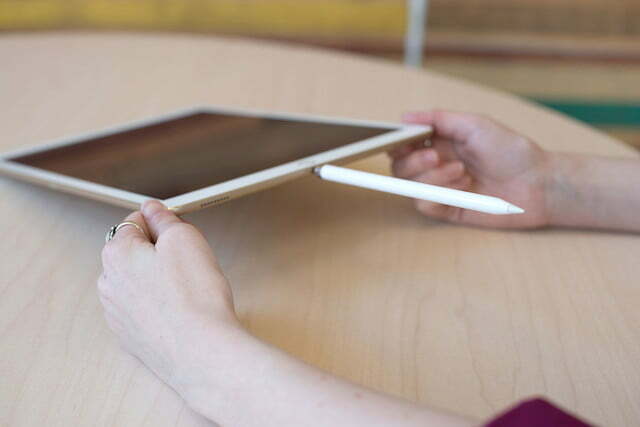 When it comes to the iPad Pro, bigger really is better.